For Christmas Josh-wa bought me a used Jello cookbook. I am sure that this gift was meant as a joke, but I was lured in by all the colors and shapes. 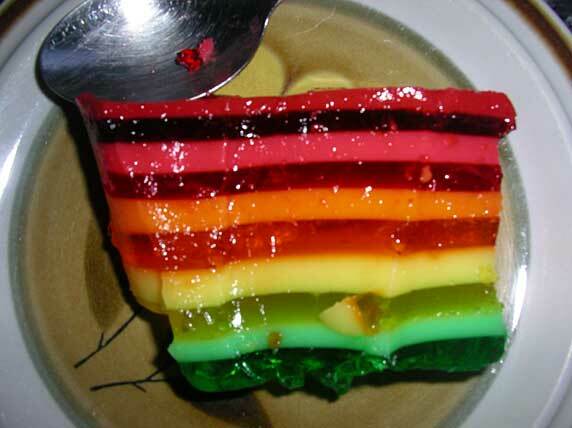 Did you know that you can make a 5 course dinner from jello?! In fact, I think my next potluck will be a jello-themed dinner party. Really, what isn’t appealing about colorful, giggly hunks of sweet, tangy goodness? Well this beaut took about 3 hours, 5 packs of jello, and a 1/2 pint of sour cream. The trick is to use 1/2 the amount of water called for in the recipe to get the right consistency to layer. No, I did not know you could make a five-course meal entirely out of Jell-o. Now that I do know it, I’m kinda scared . . .